If you are looking for a quick and easy recipe to make during the week, then let me share my recipe for a simple and zesty red clam sauce. 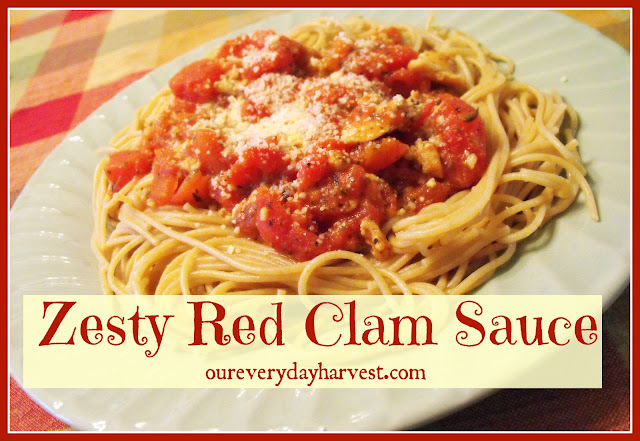 Since this is a recipe you can make in a snap, it actually contains canned clams rather than fresh in the shell clams. Heat up olive oil in a skillet. mix in diced tomatoes, salt, black pepper, red pepper flakes, oregano, basil, onion powder into skillet and simmer, stirring frequently. Once that simmers, add your canned clams and continue to simmer until everything is mixed and heated thoroughly. **If you wish you can thicken up your sauce by mixing in a small amount of flour or corn starch. This step is optional and goes according to your preference in sauce thickness. Once in a while, I add an 1/8 tsp. of corn starch to thicken my sauce up. Remember, a little of this goes a long way. After everything is done, you are ready to pour the sauce on top of your favorite type of cooked pasta. We usually use linguini, but this time we decided to make it with whole wheat thin spaghetti (pictured here). Then add grated Parmesan or Romano cheese atop, and you're all set.